I imagine it being a huge downgrade for some, not to have color on the Macintosh. Macintosh games were black and white in the beginning, while Apple II had color. I'm especially interested in experiences of people who lived through that time. I was working in software development at the time, and this wasn't seen as a problem. Colour monitors were expensive and not usually high-quality. In PC-compatibles, the Colour Graphics Adapter (640x200) wasn't regarded as adequate to be the only display on a machine; the Enhanced Graphics Adapter (640x350) appeared the same year as the original Mac, but nine months later. A monitor for it cost the equivalent of about $1500 today, and could only display 16 colours, because of the limitations of its input circuitry. A good, crisp black-and-white display was perfectly competitive with a fuzzy colour one. The company I worked for in 1984-87 replaced a CAD system that worked in colour on the Apple ][ with one that worked in black-and-white on a PC with a Hercules graphics card. The higher resolution and crisper picture made this very much preferable. The big switch to colour displays came at the end of the 1980s, with the advent of Super-VGA video cards and monitors. Multi-Sync monitors meant that a wide variety of video modes could be displayed on the same monitor, allowing games to change resolution and number of colours to what best suited them. The Mac was designed from the start to be a GUI-based machine so clear, high-resolution graphics were a requirement. At the same time available memory was extremely limited due to cost considerations. The original Macintosh only had 128kB of RAM of which over 21kB were used by the display. Going to even 8-bit color at that resolution would have pushed the framebuffer size to 171kB, more than the machine had in total. Despite its limited memory, it still cost US$2500 at release (~US$6000 today). This article gives an interesting (if brief) history of the Macintosh's early development showing its evolution from a 6809-based system to the final design. According to that article, the original design was for a 256×256 monochrome display taking up 8KB of 64KB total RAM. For back then the whole assumption of a 512x342 pixel B&W display being a downgrade from a display with an effective (*1) colour resolution of 140x192 is so strange(*2), I doubt anyone would have ever thought so back then - most definitely not me or anyone I know (*3). Colour and resolution is a trade off in memory as both need more with greater depth. With 16 KiB of screen memory (quite a lot back then) one can do a 512x256 B&W picture, or 128x128 in 256 colours (*4). So if the decision is to be made between colour added or more resolution, the first choice is always more resolution - at least until we pass several thresholds. It only makes sense to add colour if the resolution is adequate to the task intended. Here the (later) Atari ST is a great example. It offered a crisp clear 640x400 B&W display at 70 Hz. A feature that did beat many other machines including most PCs, especially considering the price. While the classic Atari ST vs. Amiga rivalry was more on a game level (*6), on a professional level the Atari outsold the Amiga by far (*7). This highlights the strange beast of assumptions, playing games. That wasn't anywhere near the goal for a Mac. It was supposed for professional usage. Something where programs could display output on screen (almost) as it would be rendered later in print. The same area the ST was successful in as well - in its competition to the Mac it was sometimes dubbed as 'Jackintosh'. The ST is in fact a great example for all of this, as it provided both, clear B&W and (acceptable) colour resolutions. With the B&W mode being a huge USP (price being next) for the Atari. In fact, it made it the machine for some cash strapped professions. Like notorious under-founded antiquarians. Signum, an editor capable to handle arbitrary scripts and their ways of writing ruled that area way into the 2000s. Not to mention that mathematicians liked it for being able to produce their secret codes. So bottom line, When there is a choice between resolution and colour, the world always goes for resolution first. I remember two guys who got them self a Mac already in March 1984 - that's even before Apple sold the Mac in Germany. They spend the (back then) ridiculous amount of close to 10,000 Mark on the computer and a printer and development software. They were hooked to the idea that the Mac was the future and they would be spearheading software development for this future. They even moved in together into an apartment, which happened to be complete empty, except for two sleeping bags, a desk with the computer and a little board with a cooker. There wasn't any money left for furniture or luxury of living. They took turns on the machine, one sleeping, one programming - or both working together. Now, with the basic workings clear, it seems strange at first, why, after ever increasing resolution, the industry added much colour (past classic 4 or 16 of EGA) around 1990 instead of further increasing past 640...800 pixels per line. That is, until we look at the output device. Until then CRT development was mostly a spin off from TV development. Screens and electronics for the likes of more than ~640 pixels per line diverged from general TV technology. Better electronics and finer screen masks where needed, requiring new production machinery, no longer to be shared with TV. A huge investment for a comparably low number of devices to be made. Adding colour was a way of the computer industry to use the increasing resources (RAM) while still using the same old CRT technology - after all, such a tube doesn't care if it's fed the 640x480 in 4 colours or 256k. And while screens for high resolutions stayed rather expensive, making it more colourful did only require investment in graphic cards. It took many years and widely available cards able to do higher resolution, until screen manufacturers jumped the wagon. *1 - The basic Apple II B&W resolution is 280x192, but it takes two pixels to produce one coloured pixel. Then again, it's way more complex than that, as Apple II colour video is unlike any other, so lets stay with 140x192 for now. *2 Or in modern consumer terms, thats 0.175 megapixels vs. 0.027 megapixels - Which would you choose? *3 - The whole question feels a bit like ignoring resolution at all. Sure, we have reached a state where next to every device just has 'enough' - or better more than the eye can separate without help. Just, it hasn't always been that way. *4 - Using 256 colour model as that's somewhat near to today's expectations. Back then 16 or 4 colour would have been way more appropriate. *5 - Rods are what gives us black & white and ... well ... resolution, while cones overlay this with rough colour areas. *6 - Where the Amiga was clearly better in technical terms, which didn't stop awesome games like Xenon, being first made for the ST. So in reality more a draw, as here the Atari held a 'good enough' position. *7 - That is excluding special areas like Video for the Amiga or Music for the ST. I believe the assumptions of the question are wrong. We did not buy the Mac to play games, it was more or less strictly a business machine. Main usage in the beginning around me was creation of printed material including illustrations. Slightly later the laser printer came along making it possible to create camera ready material inhouse. Of course, I could be an exception. At the time (early 1980-s) doing process control software for nuclear power plants in Sweden. We did have special color displays used by the power plant operators, but these were expensive special stuff. I was a VAX mainframe sysadmin when I bought my first Mac in 1985. At the time we had Apple II computers for some purposes as well as assorted Digital terminals some expensive ones of which had colour, with ASCII and some primitive block character graphics. The Fat Mac was amazing with its small screen showing beautiful high-resolution black and white graphics. Nothing matched the crispness of that screen. It was the best personal computer I could buy at the time in terms of sheer computing power and bitmap resolution. I spent more on it than my car. I personally agree with all of the answers that say something like “High quality bitmapped monochrome displays beat low quality PC color/character graphics.” E.g. for things like preparing documents for publication - affordable high quality printers were pretty much only monochrome. Why prepare a document that displays colors that cannot be printed? Except... I don’t think the market agreed with this. I think that one of the reasons that PCs leapfrogged Macs at this time was color, and slide shows / presentations. Even with a lousy projector (more like external video), or with a lousy character based printer, color seems to beat monochrome graphics. As in, the young MBAs who could show a PC slide set with color highlighting the important points impressed more than the MBAs with monochrome slide sets produced on a Mac. The PC spreadsheet with red ink for losses was more persuasive than the printout of a Mac spreadsheet without. The PC MBAs got promoted. The Mac MBAs less so. By the way, this was before PowerPoint. I can’t remember what the slide software was, but I remember fighting with it on Hercules Graphics Adapters (when helping those MBAs). MS learned this lesson, and purchased what became PowerPoint early on. I’m a computer architect (as in, I design computers, CPUs, GPUs, not buildings). At the time, I was desperately interested in how graphics would affect the evolution of computers. I bought Steve Jobs’ argument than high quality monochrome mattered more than color. I spent time designing BitBLT and other hardware support for images with small numbers of bits per pixel: 1 bit/pixel black and white, 4 bpp/16x GrayScale. I thought that 8bpp grayscale would dominate for a while, and that eventually reasonable color - 16bpp (rgba4, or rgb5), and ultimately 24bpp or 32bpp color would predominate. I neglected the “ugly” graphics modes like 16 color or 256 color, especially those that required a palette / color LUT. I was wrong in the short term, even though in the long term “nice” color eventually won out, once we could afford it. The demand for color was so high that people were willing to live with ugly tricks to get it. I say now that my believing Steve Jobs’s spin about elegant high quality monochrome beating ugly color was one of the biggest mistakes I have ever made as a computer architect. But, again, personally I still agree with what Jobs said. It’s just that the marketplace did not. Since then, I always ask myself if my personal preferences are blinding me to what the market really wants. One of the other answers says that when there is a choice between resolution and color, resolution wins. I am not sure that I am disagreeing with that, as saying that there were several different markets for computer graphics, with different requirements for “good enough” resolution and color. SW development - needs more than 50 character wide displays. Engineering, CAD - needs high res, high DPI. Can live with monochrome, although eventually wants color. Highlight color is good enough, until really good color is available. Business presentations - can live with 40 characters. Color more important than 1024 pixels. Gaming - color on a low res display, even character graphics, more important than high res monochrome. Especially if you can do Amiga like tricks, like delaying scans so that you start displaying in the middle of a character graphics block, and have icons similarly start at boundaries independent of the character block. I grew up in the 1980s, and we always had at least 1 computer around. On average, we would buy a new one every 2-3 years. At one time, I believe we had 3 or 4 at once depending on what is counted as a computer. We had an early Mac, but I'm not sure what model it was. It was purchased new, and was expensive at the time. In a lot of ways, it was inferior to our IBM AT/PC compatible. It had a tiny monochrome display, and the memory was limited. It also would not work with any of our other peripherals, including the printer. I believe it had a printer of its own, but I'm not sure exactly which one it was. The Mac was used basically just as a word processor by my older siblings. The Apple Macintosh was based on an earlier model called the Lisa which was released on 1983. The Lisa was very advanced for its time, and some of the features that it had would not be re-introduced to the market until several years later. The list price of the Lisa was $9,995, which was a huge amount of money for a PC, even for the time. Adjusted for inflation, it would roughly be $25,000 in today's money. Because of the price, the sales were poor, only selling 100,000 units. The Macintosh was released the following year to be more competitive with IBM. Under Steve Job's direction, the design was similar to the Lisa, but was a much more tame version. Instead of having 1 MB of RAM, it had 128k, and only had a single 3.5" floppy drive to save cost. Macs had a higher resolution than the Apple II. Because of this, the graphics card required more processing power and more memory. At the time the first Macintosh was built, the memory requirements for running with a color display would have been cost prohibitive. The Macintosh was also marketed as a business machine, rather than for games so the color display was not a priority at the time. The Apple Mac lines and Apple II lines actually ran side by side for a long time. 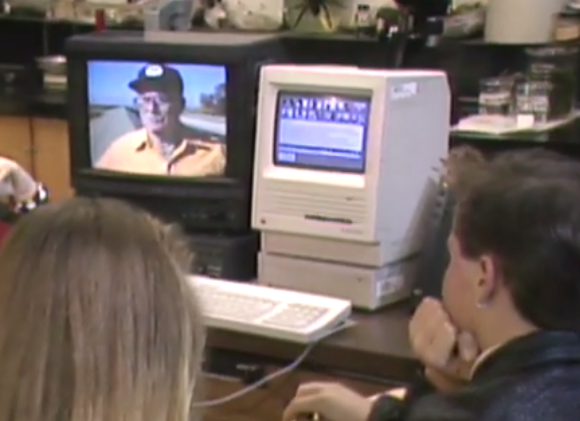 Our school still had some IIs in the computer labs right through the mid 90's that ran educational games. They were replaced by Apple LC's and we also had a handful of Power Macs. The Power Macs were primarily used for Photoshop. They also purchased several Windows PCs when the school first got Internet access in around 1995-1996. It might be hard for younger folks to understand why the Mac was successful, even with its mediocre display. When it was released, there was not as much of an interest in computers. Fewer than 1 in 10 households owned a PC. Almost nobody even had email, unless they worked for the government, or were a college professor. It would be another 15 years before most people had Internet access. These early computers were primarily used for word processing, and record keeping, and not much else. Most popular games were released for consoles, which were much more affordable than a PC. It was seen as a different kind of computer by the people I knew. It was definitely not a step forward in most ways as a gaming platform, as the Apple II had many games made for it, none of which would run on a Mac, and yes, no color. The crisp display did seem somewhat nice in its way, and there were some interesting strategy games you could play on it such as Balance of Power or Empire, but there was a bit of a "what can I play on this?" issue for Apple II gamers. The original Macintosh display used about 22Kbytes of RAM--about 17% of the machine's total, leaving about 106K for other things. Upgrading that to even four-level grayscale or a four-color bitmap would have doubled that requirement, leaving only 84K. The Apple //e double-high-res mode could support 16 colors using only 16Kbytes of storage, but at lower resolution. It may have been possible to design a system which used 44K of storage for a display mode that could accommodate full-resolution black and white and half-resolution 242-color graphics simultaneously, with the ability to move objects around on arbitrary horizontal and vertical two-pixel increments, but the design of Quickdraw is predicated on the idea that all pixels may be addressed individually. Another point not yet mentioned is that even after the Macintosh II came out with color support, its display performance in color mode was vastly inferior to its performance in black and white mode. While the Macintosh II's processor was more than twice as fast as the original Macintosh, its display performance in 16 or 256 color mode was for many operations slower. When the Quadra came out with a display card that supported 24-bit color, the performance of that in 24-bit color mode was even worse, despite the CPU being much faster than its predecessors. Had the original Macintosh tried to support color graphics using the lowly 7.16MHz 68000 the results would probably not have been pretty. Echoing what others have said, the high resolution of the graphics and shading was a means of compensating for not having color. Again, the cost of these machines meant that most people would likely be using these as business machines and not as games machines. Also worth noting, the NES was released in the US in 1985, so people wanting to play games would also be looking at purchasing that, instead of a Mac or PC. That was not a question at that time. Mainly because both machines didn't address the same kind of users. Mac was clearly more professionally-oriented especially in text edition and rendering, and color isn't necessary in that case. Scientists liked the Mac because of the more finest graphics capabilities, and there was then a lot of software that used the good screen definition for rendering functions and alike. The monochrome Macintosh was not entirely without color, due to an external device control technology that allowed programs to send commands via the serial port to an external video playback device, which then displayed color and/or animated images on a separate monitor next to the Macintosh. In the mid to late 1980's video encyclopedias were released that typically used a HyperCard stack to queue up videos or still images from large LaserDisc optical disks. Early versions of this worked with a special Betamax tape player with serial port control, and the Apple II, but the the user had to wait for the tape to seek to the video to be shown next. This later version used Pioneer LaserDisc players and 12 inch optical video discs, which allowed instant seeking to video clips, or static display of color images stored as individual frames. Not the answer you're looking for? Browse other questions tagged apple-ii apple-macintosh apple color-display or ask your own question.